SUNNYVALE, CA, Nov 14, 2018 - (ACN Newswire) - Trillium Secure, Inc. (Trillium), the leader in secure data management, was named a CES 2019 Innovation Awards Honoree for its trusted mobility platform and services at the CES Unveiled New York event. By recognizing Trillium with this award, the Consumer Technology Association (CTA) reaffirmed the mobility industry's keen interest in Trillium's connected vehicle safety and data privacy solution. 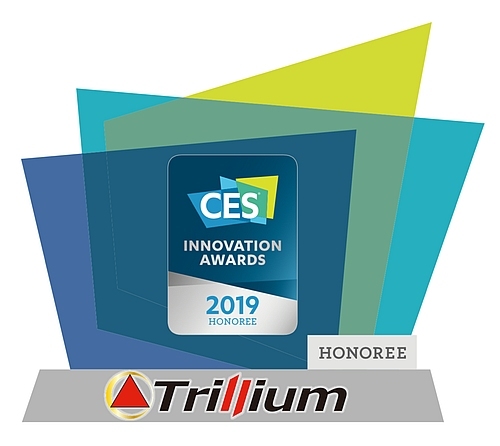 The CES 2019 Innovation Award will be proudly displayed at Trillium's CES Booth (#501) between January 8 - 11, 2019 in the Tech East section. "The smart mobility movement and the V2X landscape needs a trusted partner to keep connected vehicles, and the data generated by them safe and private - Trillium is that partner," said Dr. Sachio Semmoto, Chairman of Trillium. "The CES award represents an outstanding step in the right direction for Trillium and the greater transportation industry." The merits of Trillium's secure platform as a service were evaluated by a panel of judges, including designers, engineers and members of the tech media based on design, functionality, consumer appeal, engineering and how its solutions compare with the competition. The award winners were announced during CES Unveiled New York (Nov 8), an invite-only tech event bringing together top media, exhibitors and industry leaders for a sneak peek of the products and trends expected at CES 2019. "The CES Innovation Award is proof that Trillium is the defending champion of preserving safety and data privacy in connected vehicles," said David Uze, CEO and founder of Trillium. "We're continuing to develop paradigm shifting technologies for keeping vehicle data safe over its lifecycle, and I hope many CES attendees will get the pleasure of experiencing one of our product demonstrations in Las Vegas in January." Trillium Secure keeps connected and autonomous vehicles safe, and personal information private, through its trusted mobility platform and services. Trillium's secure platform as a service enables a wide-range of use-cases for vehicle data analytics and taps into the immense value of connected vehicle data services. To solve problems quickly, offer high value, and establish a mutually beneficial platform for monetizing vehicle data, Trillium develops its security and data management solutions from R&D and operations centers in Sunnyvale, Ann Arbor, Belfast, San Diego and Tokyo. For more information visit www.trilliumsecure.com and follow us on LinkedIn.